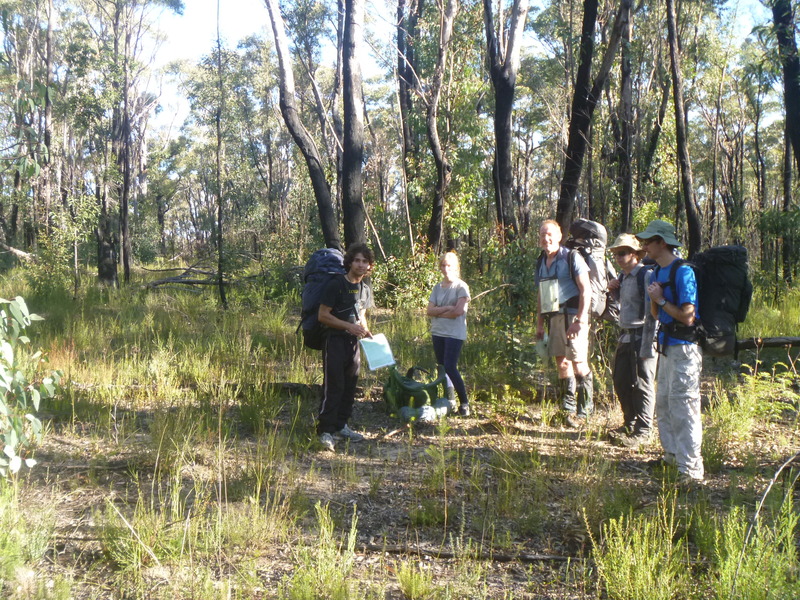 Martyn had dreamed of visiting Gospers Mountain in the middle of the Wollemi National Park in the NSW Blue Mountains for the last 20 years, and a SUBW (Sydney University Bushwalkers) party with some experience in the area held promise. He had sought permission from the landholder, undoubtedly assisted by a past common contact and being a local Kandos boy himself. The weather forecast was cool and dry, ideal walking conditions. We met up at Coorongooba Camp Ground at Glen Davis on Saturday morning 6th June 2015 but unfortunately Kristian declared himself unfit for the trip and was going to have to stay local. As we headed off, we were hailed from the riverbank by some Yarrawood Bushwalkers: “Are you Fatcanyoners?” We crossed the Capertee River balanced on fallen trees to head up to the Bushwalkers Pass. Felix provided a pack hauling rope to get us halfway up the spectacular cliffs, and then one contours the cliff line into the creek leading to a canyon. We pushed through luxuriant tobacco-like regrowth, Incense plant or Plume Bush (Calomeria amaranthoides, from the Jan 2014 bushfire, one of the numerous caused by lightning strikes at the time. The gully on the other side leading up to our ridgeline proved unproblematic, and provided spectacular views of the Capertee Valley behind us. We were startled by what sounded like a falling boulder, but glimpsed a brush tailed rock wallaby (Petrogale penicillata) bounding straight down the hill at breakneck speed. Pete explained their endangered status, and the number of expeditions that return from the field without a sighting, which added to our appreciation of the day. This was heightened by what Pete thought was aboriginal art under an overhang, though it would have passed unnoticed to the rest of us. As we had hoped, the light vegetation regrowth since the fires made passage fairly easy, and after lunch we came across an old firetrail, which is marked on the Series 1 topographical map, but not the current version. We glimpsed our goal of Gospers Mountain far ahead of us, which was both exciting and daunting, being a long way off. There were loud wing flutters as we regularly disturbed button quail (per Felix, “explosive birds”). The kilometers were reined in through the afternoon, and eventually we reached the tall trees that marked the basalt cap of Gospers Mountain. We walked up onto the cleared grassland, past a herd of robust looking Hereford cattle to the derelict shed where we believed there was a spring. In the fading light, all we could see was a cattle churned stinking quagmire. Adrian made his way down the hill, and eventually returned in the dark with a full bladder of water. The rest of the party were unconvinced by his assurances cattle harboured less nasties than sheep (ie. it could be worse! ), but the muddy water did not look so bad if one kept the torchlight off. Unfortunately, boiling did not dissipate the cow smell. There was plentiful wood, and we settled down on luxuriant grass to cook and spot the planets Venus and Jupiter, the Southern Cross, the Emu and Coalsack (the darker nebulas nearby) and other constellations in the brilliant starry sky. The waning full moon from 3 nights earlier was spectacular, but exhaustion drew us to bed. The majority of us arose on Sunday to catch a glorious sunrise from the trig station at 849m to the music of lyrebirds in the surrounding valleys, a few of which had wisps of mist. 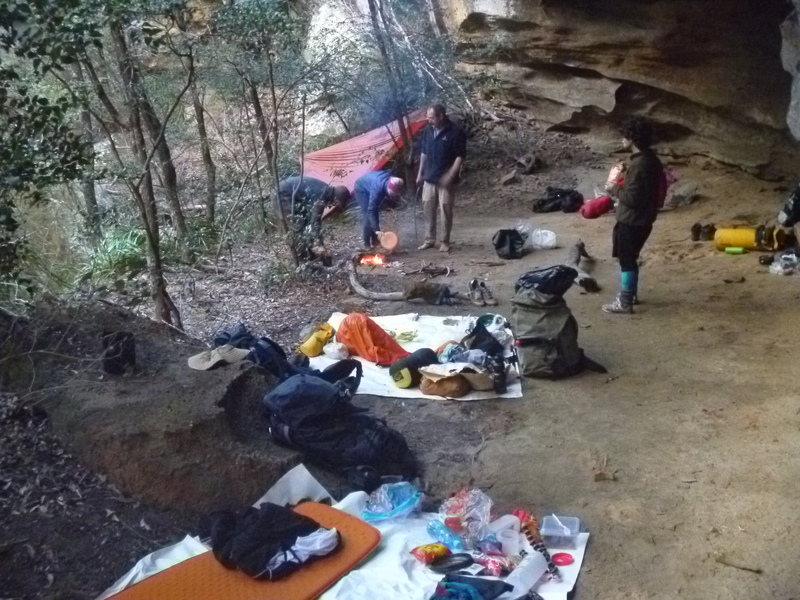 (Back at Coorongooba campground, Kristian had taken himself to a camp cave above the Bushwalkers Pass and had more expansive cotton wool clouds below). The distinctive peak of Tayan was visible in the distance. Gospers mountain was first settled in 1877 by Bob Gosper, who reputedly valued his own company over that of others and presumably cleared the basalt capped mountain by hand and fire, grew vegetables for his own use and raised some cattle. Later the bush was probably kept at bay with the now rusting tractor and roller, but without active human intervention it is only a matter of time before the invading wattle reclaims the grassland. I was intrigued by the expired food drops from 1999 for the “North Harbour Unit” in the derelict shed. Subsequent internet sleuthing and an email exchange revealed an inspiring story the likes of which one hears too little of these days. The program director of this former NSW Department of Education unit in Narremburn over time led some 100 emotionally disordered young persons aged 11 to 16 years in groups of 8 to 10 from the Kandos Weir (Dunns Swamp) finishing at the phone Box at Glen Davis. Each journey lasting 8 to 14 days visited Mt Corricudgy, came to Gospers Mountain, down the length of Gospers Creek through the gorge, negotiating waterfalls and sleeping under overhangs, then up the Capertee River to Glen Davis and the final reward ….. Maccas! After an expedition to find good water from the top headwaters of Girribung Creek WNW of the mountain, breakfast , a group photo back at the trig station, and weeding the pasture of some fireweed, it was midday by the time we left Gospers Mountain. When he planned the trip, Marty had looked forward to revisiting aboriginal rock art he had seen before the National Parks gate had blocked access about 1995. In the days before we left he received a report that it was now so degraded that it did not warrant a 35km return road bash. The road in is generally referred to as “the Army Road”, as prior to its 1963 construction it was a mere bridle trail servicing Gospers Mountain. Despite a grid reference and extensive searching we did not find another rock art site close to the Wirriba Road turnoff (blocked off) as we pushed on to the airstrip. As well as an extensive knowledge of botany, Pete had us enthralled identifying all the animal tracks on the sandy fire trail. Though none of us have ever seen a quoll in the wild (other than Pete having caught one in a trap), there were extensive tracks – most likely spotted-tailed quoll (Dasyurus maculates). Next to them were wild dog, fox, kangaroo, lyrebird and other tracks, for there were no human nor vehicle tracks. A rare view of a quoll, Australia’s native cat. 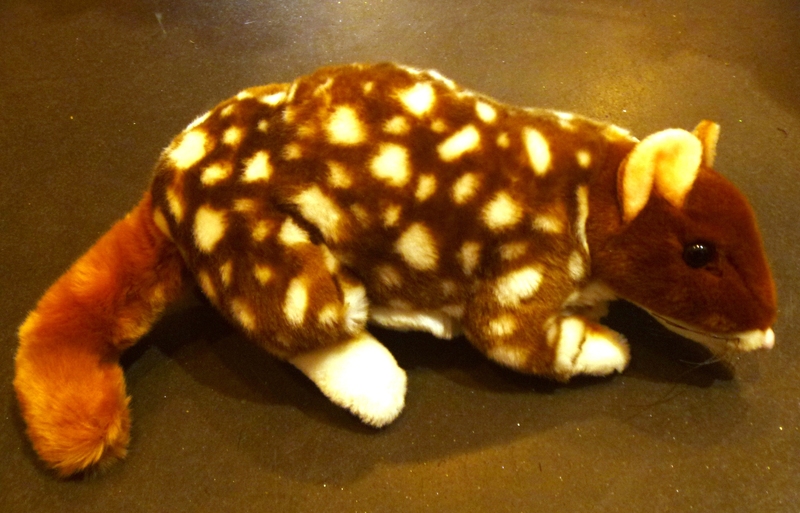 This is an eastern quoll, now almost extinct on the Australian mainland, though still common in Tasmania due to the absence of foxes. We reached Gospers Mountain airstrip for lunch. Long disused, it and the road in were built in 6 weeks by Army Engineers specifically for exercise Sky High 1 which involved 7,000 troops in November 1963 and used again for exercise Sky High 2 in April 1965, involving 1,200 troops. That was as Australia became involved in the Indonesian Confrontation and the Vietnam War . The troops were delivered by helicopter and caribou aircraft. 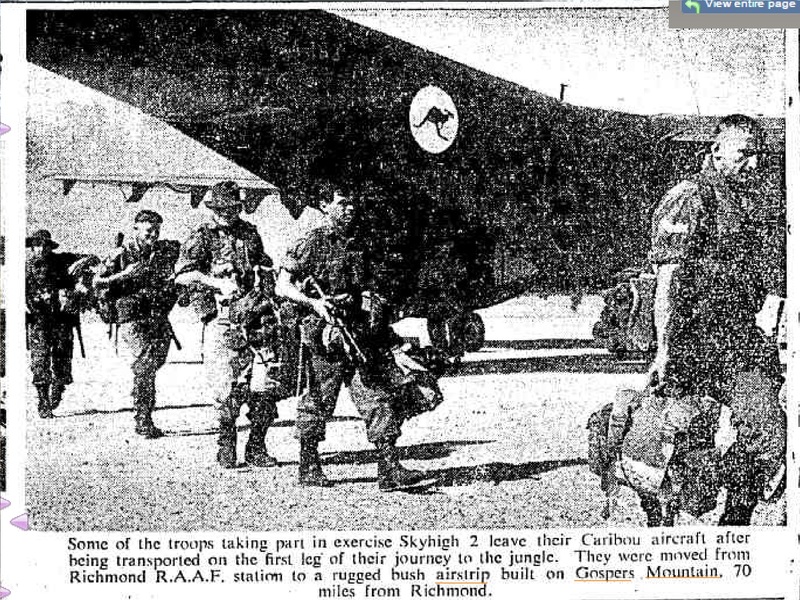 The caribou had STOL (short take off and landing) capability requiring as little as a 365m runway. I have not found any evidence that a RAAF (airforce, as opposed to army) plane ever landed here, but do wonder. This airstrip is almost 1,100m long, enough for a fully laden Hercules to take off, and its construction seems overkill for Caribou. Sadly, a Cessna C-180 Army spotter plane took off from here 18th November 1963 and crashed about 30 minutes later, some 12km farther north, killing the 3 Army officers on board. The airstrip is overgrown, a significant deterioration from Marty’s last visit before the NPWS gate erected ~1995 restricted vehicular access. There were many Pisolithus fungi balls growing on the clay base of the airstrip as we walked its length. Compaction seems to trigger fruiting – fascinating that the effects are so enduring. We pushed south down the ridge, deciding to risk finding a pass to Running Stream Creek where the map and aerial photographs suggested there was an absence of cliffline. We followed a faint revegetated fire trail much of the way, but when that gave out, the scrub became very thick. We scrub bashed off the ridge, and found the gully in the middle of the sought area to have impassable (without abseiling) dry waterfalls. We diverted right, and were caught by dusk. Felix and Adrian foraged around for some time, but still appeared to be facing 50m cliffs to the creek. In the dark they took time to find the rest of the party again. Felix then led us down to a fantastic camp cave he had found, with plenty of firewood. This left our major issue to be lack of water, since we had not refilled since the morning. Marty and Adrian set up a fly, weighted down by a stone above a billy, to catch the nearby drips. With Marty and Pete’s careful management through the night, we collected an amazing 12 litres of water – a godsend. The next day, the delicious smoky taste came to the fore when water bottles were half empty (the taste comes with the vapour smell) and some wild marketing strategies were hatched. The next morning, Monday, Damon and Felix did find a point where there was just a 20m cliff, but without harnesses and double strand rope it was judged too challenging for our party. We pushed back up onto the ridge, and retraced our steps past the man eating rock. We headed to a pass that Adrian and Felix had twice come up on a canyoning trip last December, but could not find the start. Much valuable time was lost before we found the ramp leading diagonally to the foot of a gully, and so it was 16.00 when we reached Running Stream Creek with welcome water. Speed was of the essence, and we pushed down the creek as quickly as possible, climbing through ferns and vines, sliding down boulders, sinking into mud. We avoided a jump and swim by rigging a rope on the left, and shortly later it was dark. Head torches on, and Lauren’s spare was gladly borrowed by Pete, who must have lost his. Ferns and foliage reflected head torch light, making it difficult to see what was beyond as one pushed forward. We alternated between the creek and forest/ base of cliffline on the left, stopping for occasional snacks. At 19.40 we reached Coorongooba Creek, and finally after another 3km Coorongooba Campground at 22.00. Kristian was raised from his slumber by his newly met drinking companions and we chatted by their fire before heading off. Marty and Damon drove to Wollongong via Sydney, and Adrian, Felix, Kristian and Lauren drove via Wallerawang to reach Sydney at 03.30am. In driving from Glen Davis Felix slowed for kangaroos, mice, a wombat, an echidna ……. and a man walking in the middle of nowhere. We were not sure how to answer his question of how far to civilization (none on that road until the end at Capertee! ), and drove on bemused when he did not ask for a lift. What a wonderful 3 days, in fantastic country. We try to remember half the information Pete shared with us, dream of future visits and Lauren calculates if she has enough toenails left to be able to join in. PS. Paul, Marty and Adrian were privileged on 22.2.17 to attend Andy Macqueen’s launch of his book “Wayfaring in Wollemi: stories of people in wilderness” © 2017 Andy Macqueen. The book opens with a photo ‘Evening view towards Tayan Pic, from the “throne of the everlasting hills” ‘. It is taken from almost the same location as the above Tayan Pic photo, so one immediately ascertains Gospers Mountain also has a special fondness in others’ hearts. From his chapters on Settlers, in particular Bob Gosper and Snowy Dubois, one gleans a few more details on ‘The Mountain’. The Mountain may have been called Laycock’s Mountain after that Putty family as early as the 1840s. It was named Uraterer by Surveyor Pitt in 1879, is so named on old maps, and the name stuck as late as 1931. Bob Gosper took freehold possession in 1877. Macqueen suggests Bob Gosper’s reputation as a hermit is overblown: “Being a hermit for twenty years at Uraterer – as the story goes – does not seem consistent with him spending most of his life at Long Weeney nor being one of Upper Colo’s most respected citizens”. Bob Gosper willed his mountain holdings to nephews Bill and Hilton Gosper. Alec Gosper sold them (Gospers Mountain and Mt Wirraba) to Herb Johnston about 1948, he sold it to Snowy Dubois about 1960 and he to the Kirks about 1979, around the time of the Wollemi National Park declaration. Snowy Dubois ran up to 200 head of cattle, built the sheds and yards, and brought in the tractor that feature in the above photos, as well as the cast iron bath. Although Snowy bulldozed many logging trails in the area, he took a dim view of the Army’s work in 1963 (construction of road and airfield) and the creation of the Wollemi National Park. Until the Army Road was built, Snowy used to drive cattle to and from Gospers Mountain from the Putty side via Mellong Creek, Gospers Creek to Wollemi Creek, “Snake” Creek, Goba Creek, Bull Creek and Girribung Ck. 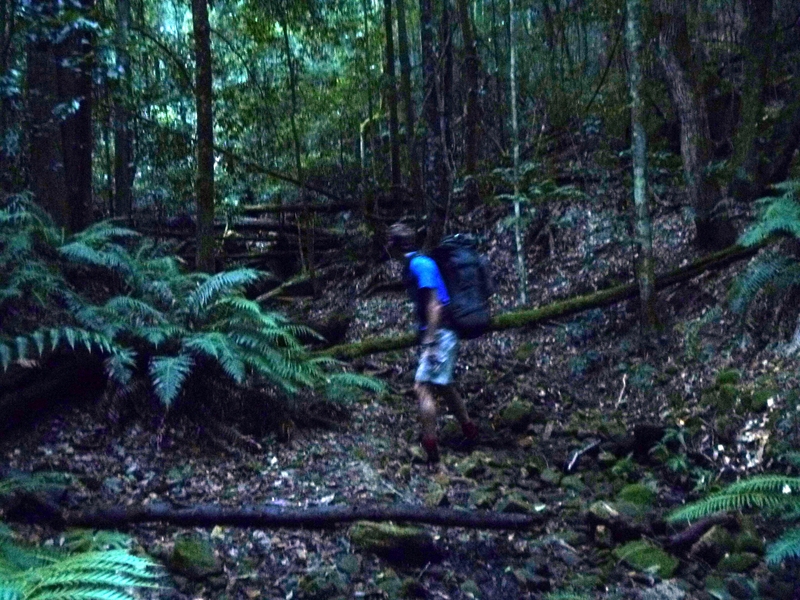 This varied slightly from Bob Gosper’s probable route via Little Weeney Creek. A future SUBW trip? Awesome read, I only recently heard about the airstrip and would love to see it for myself one day. I know the owners, and have been out to Gospers 6 times now, all by 4wd. Good to see the spring fixed up, was very muddied by the cattle tromping through it every time I’d been there. Last trip was Easter 2015.
gidday kevin , have an old vet mate who did gospers before goin to vietnam in 65 ‘. i have a property in putty up near stokes old mill & have been wanting to get bill up to gospers . i am good friends with kimmy grace , any ups on access or how to would be appreciated , regards glen cuthbert . Glen, I’ll flick you and email now with contact details for the owner of Gospers. I’m sure he’d be willing to help you out.